Description: A store-brand snack from The Real Canadian Superstore. (No Name is Superstoreâ€™s cheaper store brand, the other being the more-upscale Presidentâ€™s Choice.) Would these generic gummies be able to knock the name-brand ones from their throne and become rulers of the fruit snack kingdom? Nutrition claims: â€œMade in a peanut-free facility,â€ 100% of your recommended daily dose of Vitamin C, 100 calories per 25 g pack. Fruit content: â€œMade with fruit juice concentrates.â€ Concentrated pear juice is fourth on the ingredient list. Appearance: The snacks come in the shapes of a knight, dragon, king, wizard, princess and castle. The shapes are somewhat blobby looking with less detail than the package shows, and without the legend on the box, I might have had trouble telling which human figure was which. 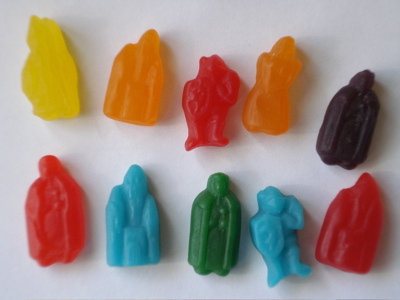 (The King [bottom center in the photo above] is a dead ringer for a gummy Virgin Mary, for example). All of the colors have a slight transparency to them except for the green and blue, which are solid and matte-looking â€“ they look as if they might have come from a different assortment. 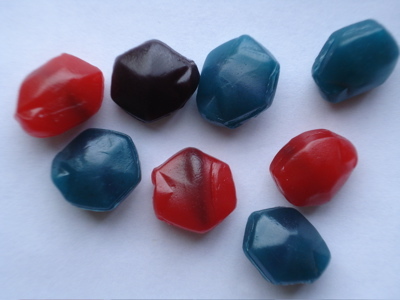 Taste: We enjoyed the Castle Adventuresâ€™ distinctive, if artificial-tasting, fruity flavors â€“ â€œThe blue tastes like raspberry, not â€˜blue flavor,â€™â€ my Assistant Taster said â€“ but didnâ€™t care for their extremely soft, almost gluey texture. Theyâ€™re so soft that they stick to the roof of your mouth, and trying to work them loose made me feel like a dog with a glob of peanut butter in its mouth. These are thickened with corn starch and pectin rather than gelatin, so theyâ€™re tentatively vegetarian friendly (some artificial colors do contain animal content, but if youâ€™re a vegetarian, youâ€™ll probably know which ones to watch out for). Description: The â€œhealthiestâ€ of the fruit snacks we tested, with the highest fruit content, and the lowest calories per pack, as well as having no artificial flavors or colors. Ironically, theyâ€™re also the most â€œcandy-likeâ€ of all the snacks we tested, being based on the popular Dare Real Fruit Gummies. Would these fruit-filled contenders prove to be as delicious as they are good for you? Fruit Content: â€œ30% fruit juices from concentrate and fruit puree.â€ Fruit juice and fruit pulp are the second and third ingredients on the list, after sugar. These snacks contain six different types of fruit juices and three types of fruit purees, not just the cheap (and nutrition-light) apple and pear used by all the other snacks we tested. Appearance: A pear-shaped blobby sort of thing, and three other slightly different pear-shaped blobby things. (According to the box, theyâ€™re a hippo, a snake, a dolphin and a scary-looking penguin with a gigantic beak â€“ or is it a pelican?) The colors are orange-brown, red and purple. (When you donâ€™t use artificial colors, youâ€™re going to be making some sacrifices, I guess). The box says there are actually 5 flavors: cherry, orange, blueberry, strawberry and raspberry. Theyâ€™re not as pretty as some of the other fruit snacks we tasted, but we suspect that kids will be too much of the â€œCandy! In my lunch!â€ mindset to care. Parents who are concerned about artificial colors and flavors in their children’s diets, as well as adults looking for a healthier, but still delicious, lunch treat, should consider picking some up. Nutrition: â€œNaturally and artificially flavored,â€ 20% of your daily requirement of vitamin C, 90 calories per 25.5 g pack. 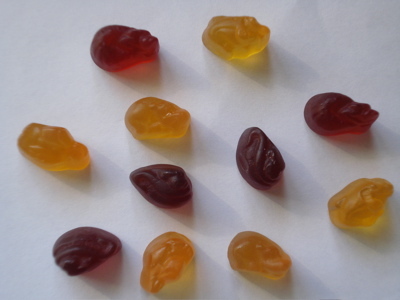 Fruit content: Though the pack makes no claims about the amount of fruit in Gushers, calling them only a â€œfruit-flavored snack,â€ they actually had the same fruit content as the Real Fruit Fruit Snacks, with â€œconcentrated pear pureeâ€ as the second-highest ingredient. Whoâ€™d have thought? Appearance: A hexagonal â€œjewelâ€ shape in a variety of colors. Theyâ€™re very soft and sticky/oily on the outside, so they tend to stick together in the pack and deform easily. Taste: This was the assorted pack, so there were three different assortments: Strawberry Splash (actually an assortment of several different colors), Gushinâ€™ Grape (with â€œtropical flavorsâ€) and Sour Triple Berry Shock. When you bite into their soft exterior, the liquid within does indeed come gushing out, so I guess the snack delivers. Their unusually sticky texture must come from the fact that they are thickened with agar-agar, a seaweed derivative. That also means theyâ€™re vegetarian-friendly, at least as far as thickeners are concerned. Overall, Iâ€™d sum up most of the flavors in one word: Sweet. Very sweet. They have an overwhelmingly sugary, stick-in-your-teeth quality that my Assistant Taster and I must have been more willing to overlook when we were children. However, the Sour Triple Berry flavor, and the occasional non-sweet flavor in the other two assortments, were rather nice. They werenâ€™t what any true sour-head would consider sour, but they had a pleasant tanginess to them, made refreshing by the liquid inside. I think I actually prefer them to the similar Maynardâ€™s Juicy Squirts Sours I reviewed last week. If my sister and I are anything to go by, kids will like these for the â€œfunâ€ factor, but if youâ€™re an adult, youâ€™ll probably want to stick with the Sour Triple Berry. And with their surprisingly high fruit content, you wonâ€™t even have to feel too bad about enjoying them. Description: A popular brand of snacks that comes in a variety of popular cartoon-character shapes: Dora the Explorer, Transformers, and so on. I went for my childhood favorite, featuring a bunch of mystery-solving kids and their talking dog. But licensing agreements donâ€™t guarantee quality â€“ would these name-brand snacks prove superior to more generic treats? Nutrition: â€œNaturally and artificially flavored,â€ fat-free, 25% of your daily vitamin C requirement, 90 calories per 25 g pouch. Fruit content: Apple and pear juice are fourth and fifth on the ingredient list. 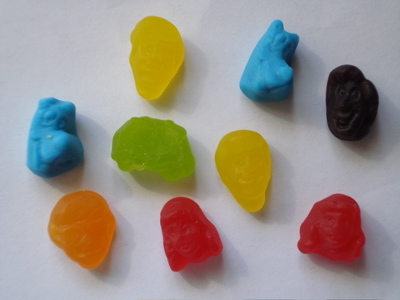 Appearance: A lime-green Mystery Machine and the decapitated heads of Scooby (blue), Shaggy (purple), Fred (yellow), Daphne (red) and Velma (orange), perhaps illustrating the aftermath of the lost episode where they didnâ€™t figure out in time that the axe-wielding phantom was really Old Man McCreedy. The photo doesnâ€™t do them justice â€“ they were a little squished, but I could definitely tell which character was which by more than just the color. The surge of bright colors and sugary flavors caused us to experience a brief sensory overload, but we managed to stave off our sugar highs, stop staging candy dramas in which the Virgin Mary teams up with the Scooby Gang to fight the evil Blob Animal menace, and tally up the final scores. By the time we cleared away the carnage of discarded wrappers, some snacks had emerged as the clear winners, and others, the losers. 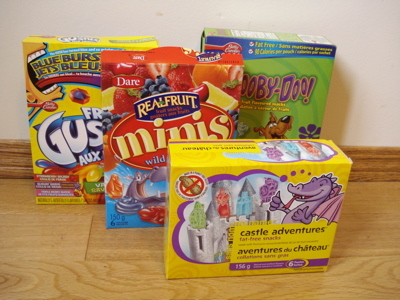 The Castle Adventure snacks had decent flavor, but bad texture, and Gushers, a childhood favorite, scored surprisingly low for their â€œtooth-hurting sweetness,â€ though the sour flavor wasnâ€™t bad. For taste and texture, my sisterâ€™s favorite was the Scooby-Doo, while I liked the Real Fruit for their fruit content and more natural fruit flavors. Yes, school lunch season is upon us, but thereâ€™s no reason to fear â€“ with the right fruit snack, even a boring lunch can become something to look forward to. I hope this review has aided you in choosing the right fruit snack for you! fruit snacks are typically so soft that they aren’t enjoyable to eat. I really like the true gummy type. Betty Crocker fruit snacks are awesome. The Scooby Doo ones are a favorite at my house and rarely last but a few days. I’m gonna buy myself some fruit snacks and pack myself a lunch. This qualifies as a fruit, right? my kids like all those fruit snacks !! !